Gravity ... first of its kind in the GCC. 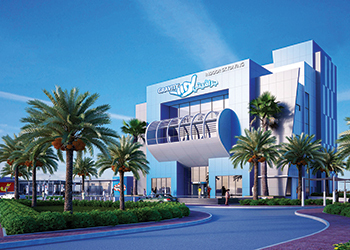 International real estate consultancy Cluttons plans to launch eight retail and food and beverage outlets at Gravity, the world’s tallest and largest indoor skydiving tunnel and the first of its kind in Bahrain and the GCC. Currently under construction, the units are set for completion and handover. The outlets cover a total area of 2,000 sq m and are available for lease in sizes ranging from 250 to 300 sq m. Based on a contemporary design, the size of the units is described as being ideal for both restaurants and shops, and are surrounded with communal parking. Gravity is located in Zallaq, close to Bahrain International Circuit. The second phase of the project will see the addition of three residential towers, due for completion in 2016. The centre allows visitors to experience flying at speeds of up to 290 kmph in a 12-m-high glass chamber accompanied by a qualified instructors. The Ramada chain will open a new 162-room property in Bahrain this month (December). The Ramada Hotel and Suites Amwaj Island will be within walking distance from Amwaj Marina and the Amwaj Lagoon, and will include an all-day-dining restaurant and lobby café. The hotel will also feature a Moroccan fine dining outlet, located on a rooftop terrace offering views of the Arabian Sea. It will also feature four treatment rooms with waiting area offering a variety of treatments ranging from Swedish, Ayurvedic and Thai massage, as well as a ladies salon, a swimming pool and an indoor Jacuzzi with a sauna and steam rooms. Ramada is part of the international Wyndham Hotel Group. Dubai builder Arabtec has submitted a proposal to Egypt’s government to construct 13,000 homes in the North African country. “In March 2014, Arabtec signed a memorandum of understanding to build one million homes in Egypt by 2020 – equivalent to about 550 per day – but the two parties have failed to agree final terms and this new proposal is entirely separate,” says Arabtec chairman Mohamed Thani Murshed Al Rumaithi. “We assume they will accept soon,” he says. Arabtec’s losses over the past four quarters total Dh2.06 billion ($561 million) as its costs rose and it took provisions. The company’s largest shareholder is Abu Dhabi state fund Aabar, which holds a 36 per cent stake. Master developer Nakheel plans to build a 750-room four star resort at Deira Islands in Dubai, UAE, in co-ordination with Spain’s RIU Hotels & Resorts. As per the deal, Nakheel and RIU will be creating one of Dubai’s biggest resorts in terms of rooms, and the first RIU resort in the Middle East at the new 15.3-sq-km waterfront city in the emirate. RIU already has 45,000 rooms across more than 100 hotels in 19 countries. Nakheel says the collaboration with RIU Hotels & Resorts is one of a hat-trick of hotel partnerships for the company in the last six months. In September, the company revealed a planned 500-room Avani-branded resort with Thailand’s Minor Hotel Group and a few weeks later announced a partnership with Centara Resorts, also from Thailand. Nakheel is planning 10 new hotels across Dubai as part of its expansion into the hospitality and leisure sector; five of which will be at Deira Islands, one on Palm Jumeirah, two at Dragon City and two at Ibn Battuta Mall. Lifestyle destination ... a perspective of the marina. Amlak, the real estate investment arm and a wholly-owned subsidiary of the Social Insurance Organisation, has launched the second phase of its project to develop a marina in Bahrain and awarded new contracts. 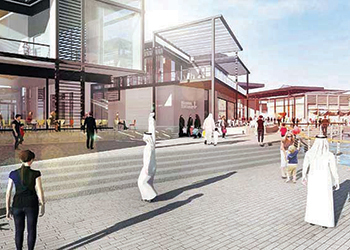 “We are pleased with the progress made so far on the Bahrain Marina Development Project. We have also appointed the most experienced consultants to drive forward the next phase of the ambitious project,” says Amlak chief executive Mohamed Abdulelah Al Kooheji. The second phase focuses on clearing the existing site and finalising a detailed master plan in order to move forward into the development phase. A team will also conduct a number of on-site studies including extensive marine studies. The development stretches along a coastline in Manama and will be positioned as a prime lifestyle and leisure destination. Aiming for completion in 2020, the project includes a five-star hotel and serviced apartments along with freehold apartments and waterfront villas, a shopping mall, a family entertainment and educational centre and recreational waterfront space with dining and retail facilities. A yacht club, meanwhile, will cover an impressive area with the capacity to berth a vast number of boats. Benoy has been appointed the lead designer, project management has been awarded to Bruce Shaw, HAJ has been named quantity surveyors, Hyder Consulting the traffic and road consultant, and Aecom the marine consultant. Work on Manara Development Company’s Kenaz Al Bahrain residential project is nearing completion. Manara managing director Dr Hasan Al Bastaki says: “We launched this project eight months ago and have so far completed 70 per cent of the construction work. The project is scheduled for completion in the next four months. Located in the Northern governorate of Bahrain, the project features eight four-storey buildings boasting modern designs. Two apartments have been planned on each floor and a total of 64 apartments designed according to the latest construction and engineering standards and specifications that meet the future housing needs of modern Bahraini families. Manara Developments chairman Yousif Taqi says they are keen to provide real estate innovations and solutions to the Bahraini people. “We are committed to our plans that keep us in the lead of the real estate development companies, and to find housing solutions, especially for the limited-income segment in the kingdom,” he says. Each apartment has three bedrooms, a large kitchen in addition to a large lounge, three bathrooms and a maid room on a 157-sq-m area. Each building has separate parking spaces for residents. Taqi says Manara has further projects in the pipeline which would be announced in the coming months. The homes can also be bought under the Ministry of Housing’s social housing financing scheme. Units are priced at BD59,900 ($157,694) onwards. Durie (left) and Dr Gurg sign the agreement. 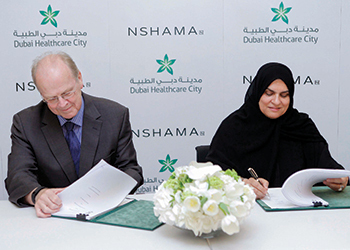 Dubai Healthcare City Authority and Nshama have joined hands to develop a mixed-use project at Al Jadaf area in Dubai, UAE. As per the agreement, the plan includes the creation of a dynamic living, working and recreation environment for the Dubai Healthcare City community, residents, and medical tourists. Called Al Fursan, the development will comprise premium apartments, serviced residences, four- and five-star hotels, and retail and leisure features, spread over 2.9 million sq ft of Dubai Healthcare City’s Phase Two expansion project. It will be located at Al Jadaf Dubai, parallel to Al Garhoud Bridge overlooking the historic Dubai Creek lined with cultural and architectural sites. Dubai-based Nshama is a private developer of smart, integrated and sustainable communities. Dr Raja Al Gurg, vice-chairperson and executive director of Dubai Healthcare City Authority, says: “The partnership with Nshama demonstrates Dubai Healthcare City’s commitment to sustainable urban planning and the importance of bringing together interdisciplinary stakeholders to ensure long-term growth. Fred Durie, CEO of Nshama, says the joint venture is a key addition to Nshama’s development portfolio.